Manage each stage of your innovation supply chain and intellectual property commercialization, from initial invention disclosure through licensing agreements and revenue distribution. Easily track the critical activities and action items of your technology transfer office to reduce compliance risk and maximize financial impact. Continually monitor on issues that affect portfolio performance and derive key business intelligence with powerful analytics tools and detailed reports. Capture critical information such as documents, e-mails, correspondence, notes, and more. Customize Inteum with unlimited User Defined Fields and a built-in Content Management System. Read about one of our customer’s award winning implementation of Inteum. Whether it’s patents, copyrights, trademarks or any other type of intellectual property, it can all be recorded and managed within Inteum. 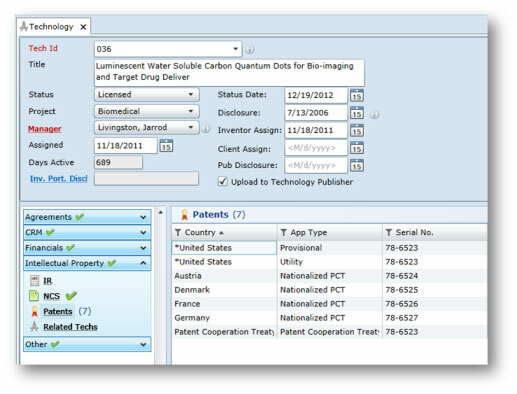 Record all details of the IP Asset and the Technology, including key dates, legal information, and status, review the complete patent genealogy tree at a glance, and stay on top of your compliance obligations. Inteum has the power and the flexibility to manage all types of agreements. From Confidentiality and Option agreements to License agreements, Inteum can ensure that all details are recorded and that the agreement obligations are met. Store the executed copy of the agreement against the agreement record, highlight important clauses in the agreement summary, and create records of milestones and reports. 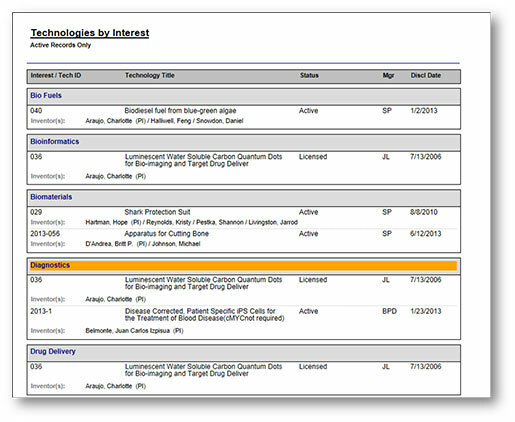 Quickly identify potential licensees for your technologies as Marketing Targets, track correspondence, designate priorities, and even bundle your targets into Marketing Projects. Find the perfect partner for your Technology, advertise your licensing opportunities using Technology Publisher, store all contact and company details, and track emails. Inteum has all the tools to help you manage and monitor the financial impact of your technology transfer efforts. Generate Payables and Receivables, quickly generate invoices and statements, generate reimbursable expenses for Agreements, track revenue distribution, and create expense budgets. Inteum’s comprehensive reporting and analysis tools to help you derive key business intelligence from your portfolio and make informed decisions. What is the financial impact of our Green Technology project? How many disclosures did we receive last month from the Engineering department? What companies may be interested in our new technology? 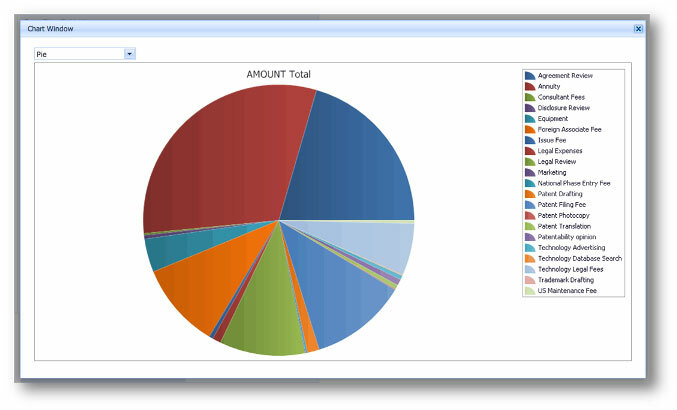 Inteum includes over 130 standard, built-in reports to analyze and track all aspects of your portfolio, as well as Analytics for Inteum, which features a wizard-driven report creation process that allows users with no technical knowledge to create advanced, custom reports with just a few clicks. Inteum also features a user-customizable Dashboard with graphical reports on over 26 major data areas in Inteum, all of which can be easily printed or exported, as well as instant on-the-fly Excel reports. Inteum includes powerful tools right out of the box designed to streamline your technology transfer efforts. 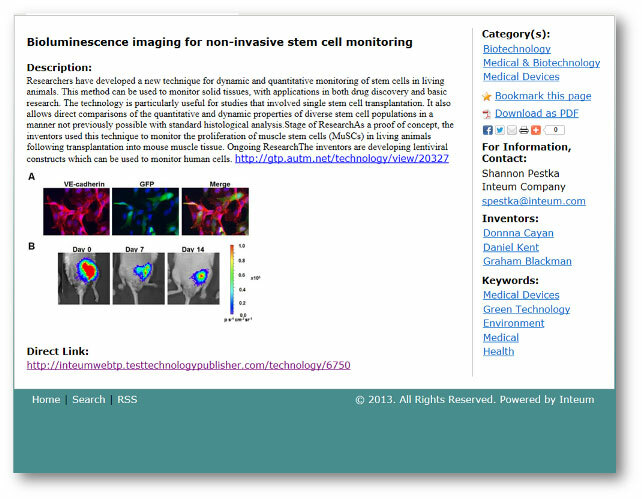 Publish your technologies available for licensing to a fully customized web portal with keyword search functionality, categories, NCS, and more. Can be easily integrated with your current website. Fully customizable online portal allows inventors to submit invention disclosures online and communicate with your TTO staff. Automatically creates corresponding records in Inteum upon submission approval. Read our case study on how WSU streamlined its invention disclosure process with the Inventor Portal. Capture data not included by default using User Defined Fields. UDF’s are immediately available on screen and can be included in search results and reports. Customize any field labels (rename) to match your organization’s terminology and even choose from English, Spanish, Brazilian Porteguese, or French default languages. Easily track the critical activities and action items of your IP department to reduce compliance risk and maximize financial impact across your knowledge supply chain. Identify upcoming deadlines or due dates. Create tasks manually, or automatically with the Sentinel Notification System, using your own custom priorities. 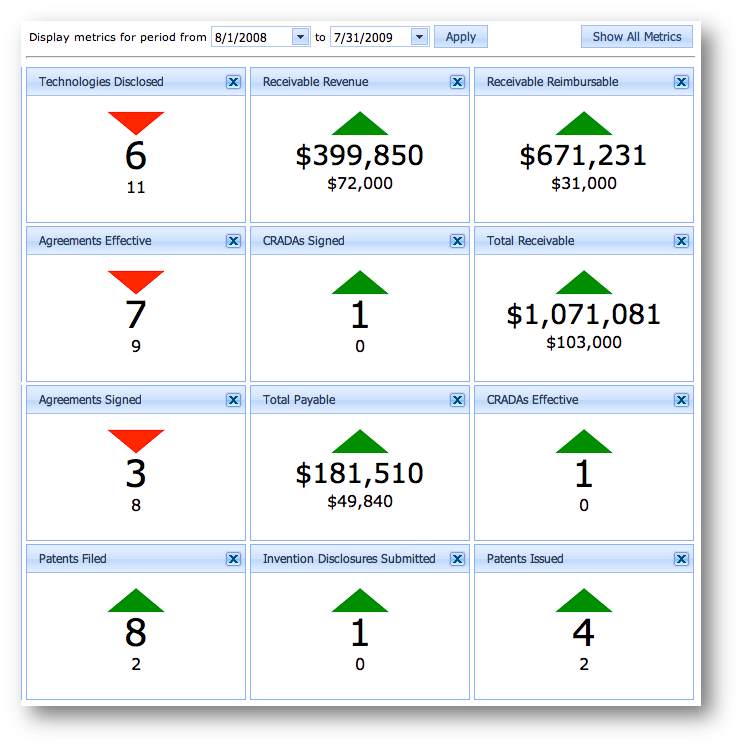 Analytics enables directors, managers, business experts, and end users alike to derive business intelligence through interactive dashboards, querying Inteum data, building reports, performing graphical ‘drag n drop’ data analysis, and deliver this information efficiently throughout the organization. E-mail directly from the system or use the Inteum Web Plugin for Outlook to associate your e-mails directly within Outlook without being logged in to Inteum. Create editable form letter templates for different record types. Create detailed, extremely powerful programmable alerts about key events in your database. Automatically send e-mails, add Remarks, or create action items. Designed in close association with United States Federal granting agencies, easily report on inventions that are funded by federal institutions. Upload to iEdison directly from Inteum to comply with Bayh-Dole regulations.